Our beautiful handmade glycerin soap will leave your skin feeling soft, clean, and pampered like no ordinary soap can! 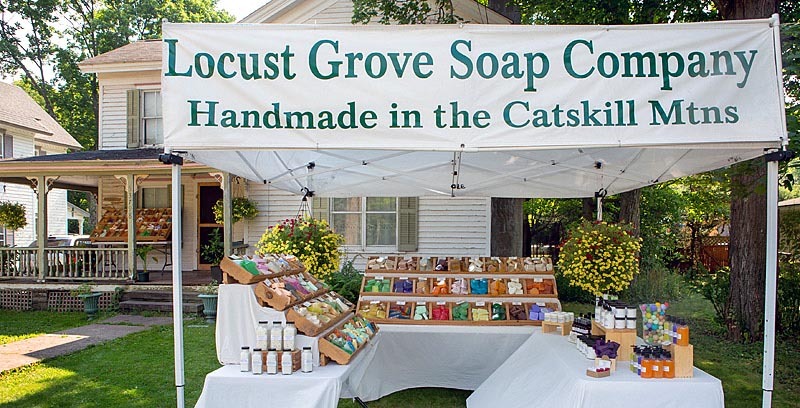 Locust Grove Soap is a home based soap company located in the Catskill Mountains of New York and specialize in glycerin soap. All our glycerin soaps are hand crafted and personally wrapped and packaged by us. We use a pure vegetable glycerin base for all of our soaps. There are no alcohols or detergents in the base, which tend to irritate your skin. Glycerin is a natural moisturizer of skin, a humectant that draws moisture to the skin. It is also animal (no animal testing for any of our products) and environmentally friendly! Why use our Glycerin Soap? Although we test all of our glycerin soaps ourselves, some customers may have allergic reactions. Should irritation occur, discontinue use immediately. Handmade glycerin soap will leave your skin moisturized and feeling soft. Relax to one of our soothing scents while the natural glycerin beautifies your skin. We Accept Mastercard, Visa, Paypal, Check or US Money Order.